Have a ton of dormant group chats you’re too awkward to talk in but want to find some ways to start a conversation? These Telegram bots will come to the rescue! The hundreds of messages (or notifications) are going to be worth reviving that group chat (and your friendships)! Alternatively, why not create a new group just for playing the Telegram game! Once you’ve downloaded these games, here’s a list of channels, bots and stickers you should be adding into your Telegram account too! Love testing your general knowledge? Then this Telegram game is built for you! 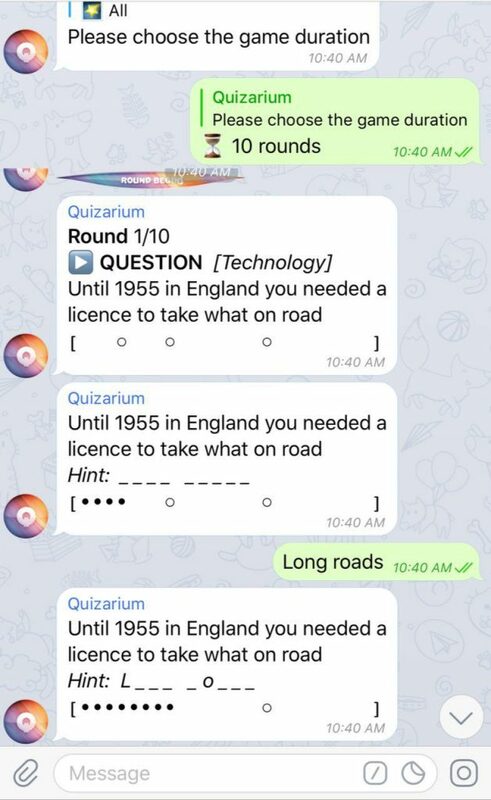 The concept behind Quizarium is simple – the bot asks a question and depending on how fast you reply, points are allocated. Everyone in the group will start guessing (or typing at random) what they think the answer is. Depending on the number of alphabet hints released by the bot thereafter, points are given to players with the correct answer. Points range from one to five. If two players answer correctly at the same time, points are awarded to both players. The player who gets the most points at the end of the game wins! 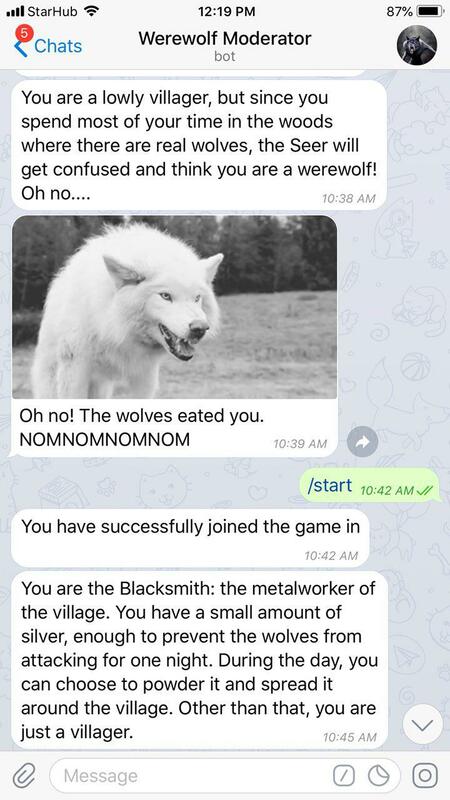 The fun in this game is when players give completely irrelevant answers, so your creativity is the limit 😉 Take note that this Telegram game results in a lot of spam, so if you aren’t in the mood to play the game, it’ll be best to mute the group. You have probably played the game ‘Polar Bear’ or ‘Mafia’ at some point in your childhood. 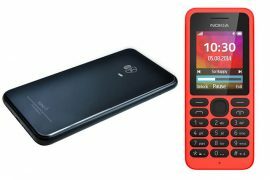 Werewolf allows you to relive those memories, in a more high-tech version! For those who haven’t heard of this game before, here is a short summary. You and your friends are in a village, with ‘unique’ folks. Among the group, there’ll be a werewolf, and his/her mission is to kill off all the villagers before the game ends. Villagers, on the other hand, should work together to figure out who the wolf and ‘lynch’ him/her before it kills off the entire population. At the end of every ‘night’, villagers will have the chance to vote for who they think the werewolf is. Majority wins, so if the majority votes for an innocent villager, you’ll end up killing off someone in your team. If you’re team villager, that is. The bot will delegate time for the wolves and the players to make their choice and discussion can be carried out within the chatroom. You could also play this game in real life, by making use of the bot’s role allocation but having a discussion face to face with your friends. All players will have a separate chat with the Werewolf Moderator Bot, where it’ll inform you of your roles and task. Depending on the role and ability of your character, you’d be able to select some options that are crucial in the game. Example: If you’re the Werewolf, you’ll have the chance to select which player you want to kill. Happy Hunting! Pro Tip: We’d recommend playing this Telegram game in ‘Chaos Mode’ for a greater variety of characters, it’ll also be more fun! Playing in larger groups will also increase the duration of the game (and possibly the number of werewolves)! Miss old-school arcade games? You don’t have to anymore with this Telegram game! Gamee promises hours of fun and endless activities as there’ll be tons of arcade games for you to choose from. 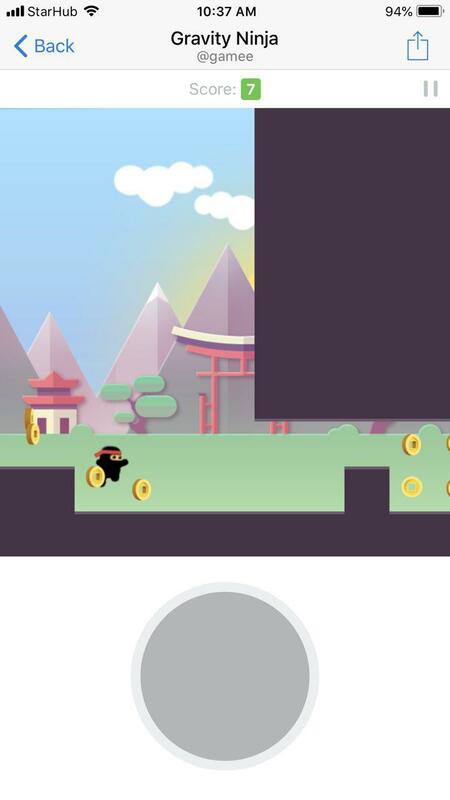 From Gravity Ninja to Snake, these classic games are recreated in this bot! Travel down memory lane, challenge your friends and show off your high scores, or try to stay on top! The games in the bot are pretty straightforward, but they’ll also come with instructions so you’ll be able to play them with ease! 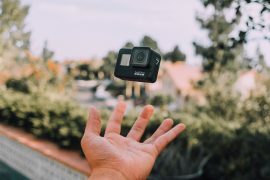 Beware that your competitive spirit will be at an all time high with Gamee! 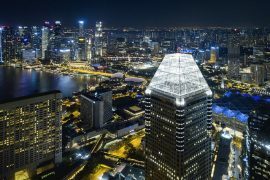 However, if you want the authentic arcade experience, check out these arcades in Singapore you can visit! Instead of literally adding a bot to your group, simply type ‘@gamebot’ in the chat (don’t press enter) and wait for it to load. You can then select from a list of games including Lumberjack, Corsairs and Math Battle. Out of all these games, we strongly recommend Lumberjack. 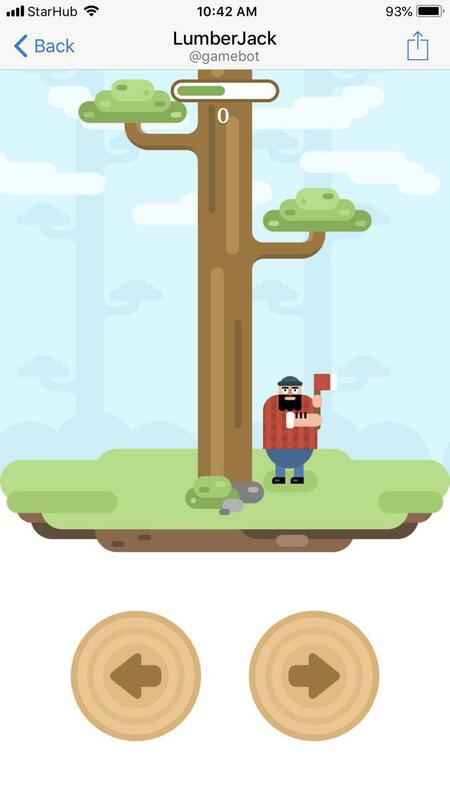 In this Telegram game, you’ll be playing as a Lumberjack — chop wood by using the left and right arrows while trying to avoid getting hit on the head by a tree branch! 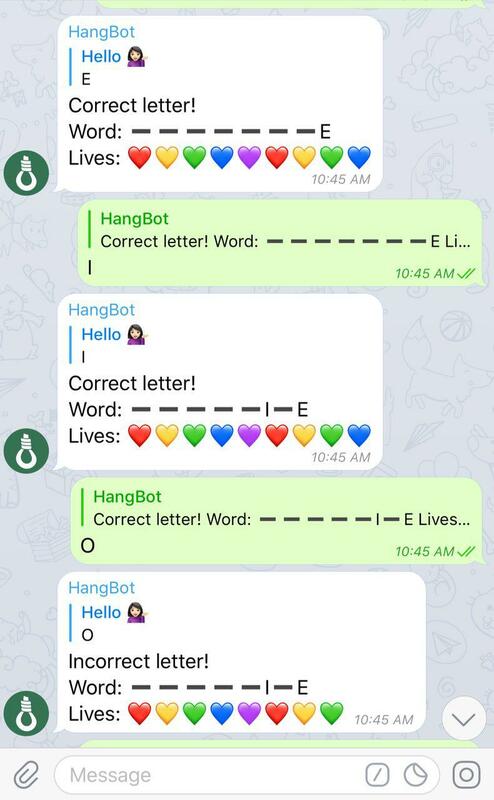 You know technology has been taken over by bots when even the ever popular ‘Hangman’ gets replaced by ‘Hangbot’. Just like its human form, the bot comes up with a word. Everyone in the chat group has to select letters or guess the word, and you’ll lose lives in the process if you make a wrong guess. The game ends when all lives are lost. 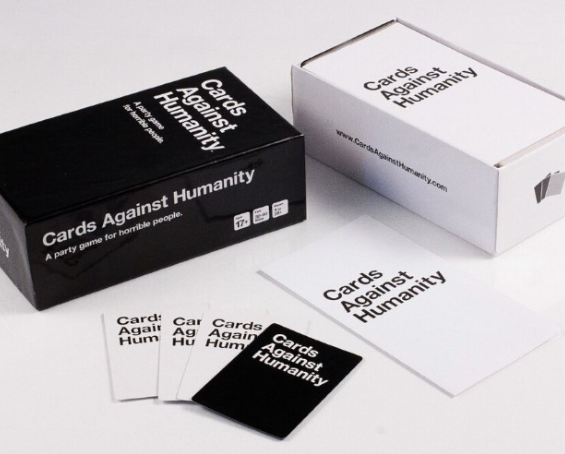 With the interesting pun on Cards Against Humanity, this Telegram game version serves the same purpose. Players take turns selecting what they think is the funniest answer among their cards in reply to a question generated by the bot for player ‘A’. Player ‘A’ will then have to choose the most humorous answer out of all the submissions. The player who submits the chosen answer gets a point. The game continues so that every player gets the chance to be Player ‘A’ and the one with the most points win! 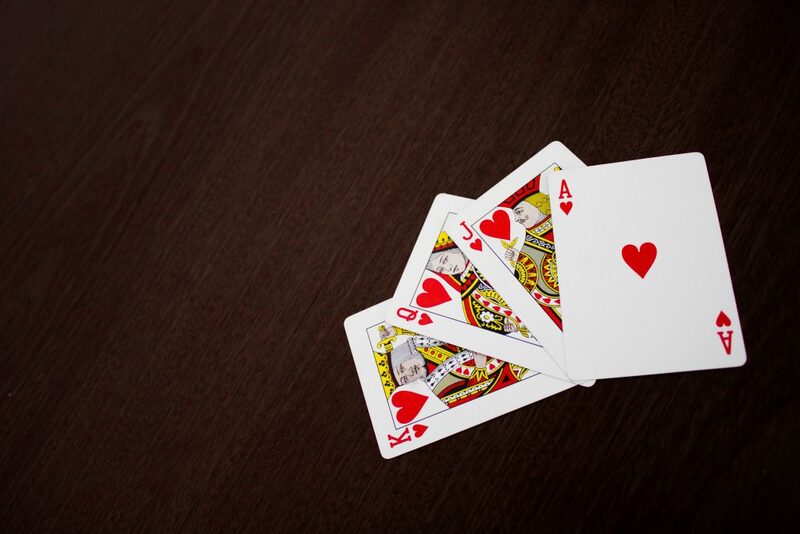 Couldn’t find your stack of poker cards at home but desperately in need of a party game? 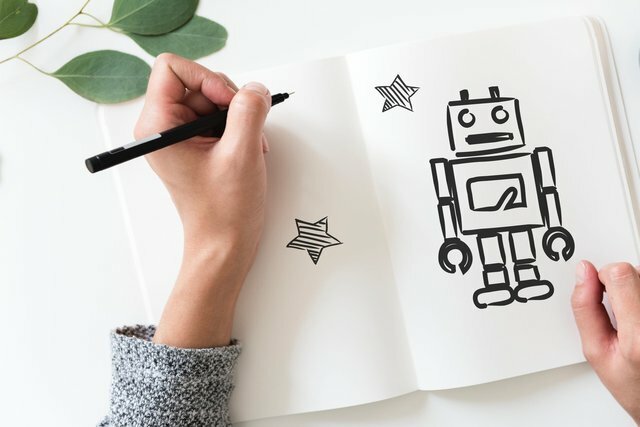 Pokerbot will save you from all the stress and frustration! Play against four other players, who can be your friends or even random players! You’d even be able to play against up to 8 other people! Not so much of an online person? Then check out some of these cool board games you can play face to face with your buddies! *TNC Applies. Valid for new users from 16 to 23 July only. 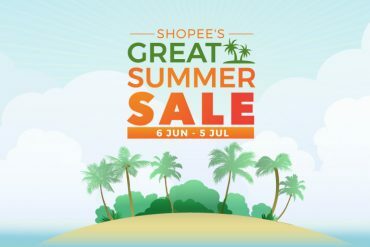 PSA: Shopee’s Great Summer Sale Is Happening From 6 June to 5 July!